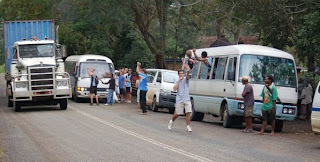 On Saturday we hitched a ride to Goroka with the parents of the High School boy’s basketball and girl’s soccer teams. 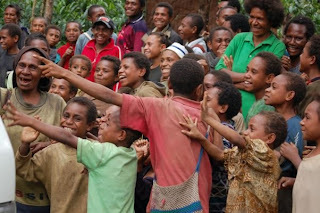 They were going to a tournament, and we went along because I (Susan) had never been to Goroka. (Brian had been there once for work the previous week.) The 1 ½ hour ride up to our nearest “big” city was uneventful, as was most of the day. Brian and I had a nice lunch at a fancy hotel, but my plans for doing some shopping were thwarted due to the fact that most things are closed on Saturdays. 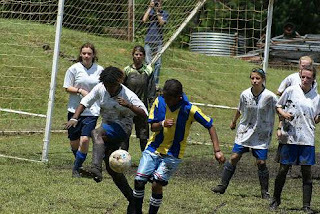 But we had fun watching the sports tournament – especially the girls’ soccer, which was played on a field that turned more and more into a mud pit as the day went on. On the way home, our van was way ahead of the caravan that included the teams and most of the parents. But then we got a call on our cell phone – one of the vans had overheated and was broke down on the side of the road. Since our van had Brian as well as two other mechanically inclined men in it, we turned around to go help. We found the two buses and two or three vans pulled over on the side of the highway right in front of a village. Of course, the villagers were not about to miss out on anything exciting that might happen, so we had about a hundred people crowded around the vehicles watching. Unfortunately, there was nothing to be done for the broken down bus, though Brian and the other guys spent an hour trying. We finally loaded all of the kids and cargo into the other vans, and left the bus in care of two men who volunteered to stay with it until a truck could come from Ukarumpa to tow them back to Goroka. So here a few photos of the muddy girls playing soccer, the caravan on the side of the road (with teenage boys being teenage boys and trying to get passing trucks to honk at them), and a bunch of villagers crowded around one of the vans.